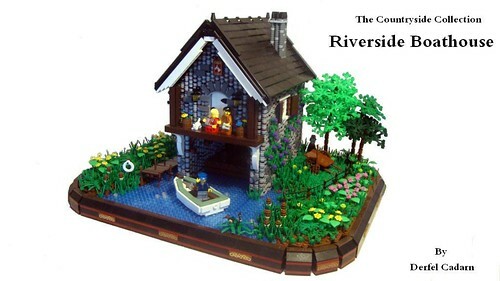 Brick Town Talk: I Live on Land and on Sea - LEGO Town, Architecture, Building Tips, Inspiration Ideas, and more! The number of 1x1 rounds used in this model is astounding. They capture that rocky texture very well while contrasting nicely with the surrounding greenery white "woodwork." Who can't like that boat either? Awesome job on this! Oh my god! Awesome! I need to step up my game on my greenery! Love the detail on the dock and cart too.